Shay Carson Onorio has joined the Red Thinking Team as its new president. Company plans for strong strategic growth with its strong leadership team and commitment to design excellence and client service. My partnership with Jen and her creative team is founded on mutual respect, a love of what we do, and a shared commitment to take things to the next level, with a life balance that we have defined together. A new partnership has been announced between marketing powerhouse professionals Jen Sterling and Shay Carson Onorio. 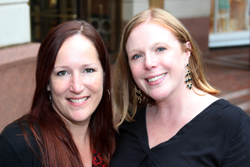 The two women have joined forces in Red Thinking LLC, an integrated digital, brand strategy, and design firm that is poised to make an indelible mark in the ever-evolving business landscape of the Metro D.C. area. As the new Red Thinking, LLC President, Onorio brings a deep skill set in process, operations, client communications, and brand development. “My partnership with Jen and her creative team is founded on mutual respect, a love of what we do, and a shared commitment to take things to the next level, with a life balance that we have defined together,” Onorio explains. Onorio has two decades of marketing and advertising agency experience as Director of Account Services for Williams Whittle in Alexandria, VA, Director of Marketing at Hawk’s Cay Resort & Marina in the Florida Keys and, most recently, Vice President at Delucchi Plus, where she guided the execution of campaigns and brands across all channels of communication. The business collaboration capitalizes on each partner’s unique skill set: Sterling’s exceptional design, creativity and ability to visually translate clients’ objectives into tangible, cohesive visuals; Onorio’s expertise in maneuvering the nuances of client services and skill at deftly guiding overall business operations. For more information, visit redthinkingllc.com. Red Thinking, LLC. is a client-focused firm in the Washington, D.C. metro region specializing in integrated digital, brand strategy, and design. Client services include but are not limited to: print, digital and traditional collateral, data collection and analysis, social media, SEO and PPC, website and logo design and development. In addition to being a playful reference to their hair color, the firm’s choice of “red” in the name evokes images of passion, energy and boldness – attributes that speak to the company’s unconventional methods and thought-provoking style.